Well, I have been there, done that, and I simply could not recommend Anne Sexton Pilates highly enough. I have nearly twenty years’ experience working in the fitness and leisure industry, & only, relatively recently, made the decision to retrain as a Pilates instructor. 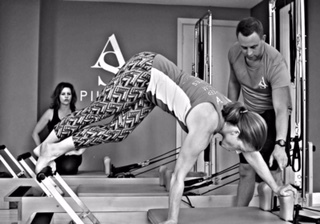 With her support, guidance & unparalleled knowledge, Anne has helped steer me as a Pilates instructor. I now teach mat, reformer, tower, barre, pilates on the TRX & on the ball. Because Pilates is so functional, it has not only replaced gym training for me, but also gives me so much more. It is easy to be passionate about something you really believe in. I can see how pilates benefits everyone, I can feel how much pilates has benefited me.